Shree Gautam Creation is a renowned enterprise situated at Mumbai, Maharashtra, India, is one stop solution for the world's most aesthetic innovation marked in the forms of assorted Indian Fashion Jewelry at wholesale rates with high quality product. 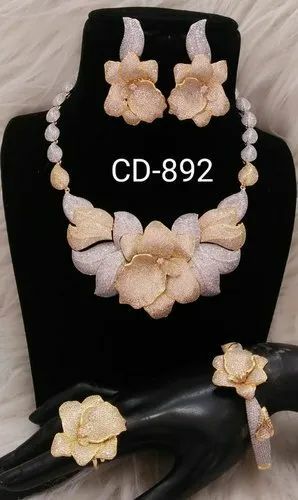 Our firm is a famous manufacturer, trader, exporter and supplier of an exquisite range of AD Necklace Sets, AD Pendant Sets, Designer Earrings, The offered products are crafted and designed by our licensed vendors using finest quality beads, stones and other material and latest techniques in rigorous conformity with the varying trends of the industry. Further, our products are meticulously tested on different parameters by our expert quality checkers. These products are widely appreciated for their magnificent design, dazzling look, finest finish, skin friendliness, easy to wear, resistant to allergy and shimmering appearance. In addition to this, our products are presented in varied patterns, designs, finish, colors and sizes as per the requirements of our clients.